Tag Archives for " Optimize "
Some years ago smart marketers latched onto the idea of something they referred to as integrated marketing. The idea behind this concept was to make all aspects of marketing such as advertising, sales promotion, public relations, and direct marketing work together as a single force, rather than allowing each to work as a stand alone. The concept made complete sense, but then something really big happened. The relationship that our prospects have with our marketing communications has changed dramatically. Marketers are no longer in control of how a message is consumed, who consumes it, when they consume it or even who produced it in the first place. Social media, search, TiVo, and little things like the “do not mail” list altered the practices of lead generations through broadcast marketing forever. As marketers started to discover the new reality of the need to be found, a new word started to creep into the marketing lexicon – optimize. The term itself has been with us since the dawn of search and has been mostly applied to the practice of search engine optimization or SEO. But now it must be applied more broadly than the notion of keyword rich content and high quality backlinks. Today, every element of our marketing must be optimized to take advantage of the fact that it may indeed need to work in isolation. This doesn’t throw off the notion of integration; every element of your marketing working in tandem is still a good thing. It adds, however, the reality that much of your marketing may be encountered in ways that you no longer control and every element must be able to do the job of moving a prospect forward on its own. Today’s marketer must rely on outposts, such as social media networks, to open up new paths of entry for a prospect. They must rely on educational content to draw the attention of those researching online. They must participate in communities that exist for the sole purpose of building trust and providing proof. They must optimize every brand asset and put them in places where prospects might stumble upon them. Few marketers online have shared my longstanding belief about the optimization mindset so thoroughly as Lee Odden, publisher of the Top Rank Blog. Lee has been urging SEO types to embrace the marriage between search, social and content for as long as anyone I can remember. This month Odden released what I think is an absolute must read for anyone that wonders about the practical realities of the new world of marketing. 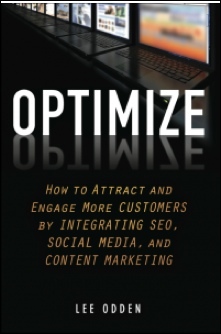 The book is simply titled – Optimize. Optimize introduces the concept of the optimized mindset and in opinion says just as much about how you need to think about your business as being a guide for how to turn practical social media and content marketing advice into action. Odden stopped by the Duct Tape Marketing Podcast to talk about Optimize and the future of marketing online. You see, integration isn’t enough anymore – Today’s marketing requires the optimization of every element and it’s a mindset as much as it is a tactic.